The changing economy has created winners and losers when it comes to current career prospects. Some workers have had access to great opportunities emerging from organisational change. Others have faced a very different world with unstable career prospects. Over the last 15 years, we’ve been conducting employee surveys for our clients and we’re seeing a change in attitudes. The curious change in the profile of worker attitudes isn’t about their intention to stay with an employer, but their sense of resilience to face whatever happens. When we ask people about their intention to stay with their employer, many have looked to hold on to their current job. Some have reported a ‘bumper’ time for their career growth – finding new opportunities that may not be available in a more stable workplace. However, others have had a very different experience and have a very different attitude to employers – with lower levels of trust and sense of job insecurity. Resilient tigers – this group of workers have had a turbo charge to their career during the last few years. Moving with stealth through organisational changes, they have taken advantage of new opportunities to expand their responsibilities, skills and worth. Their employability is relatively strong and new opportunities continue to present themselves through the resilient networks they have been able to maintain. Loyal dogs – this group of workers has also ‘survived’ the workforce cuts imposed by their employer. Faced with an increased volume of work as colleagues have left, they have had to swim harder just to stay afloat. Although loyal to the many demands of their employer, this group has not ‘gained’ in terms of their career and may be feeling demotivated. Weary meerkat – this group has experienced difficult times during the last few years. They may have involuntarily changed jobs and still fear for their job security especially if they find themselves on a fixed-term or part-time contract. Their trust of employers may be limited and their weariness may affect their ability to engage in the organisation beyond delivering the requirements of their immediate job. Adaptable chameleons – this group may also have faced a tough few years yet they have evolved to fit the new order. This group is likely to have taken stock of their skills, identified new opportunities and changed direction slightly (or significantly). Armed with the latest technical skills which they may not have developed in their previous job, they have learned to be adaptable and their new skills are in demand as they offer something many employees do not. 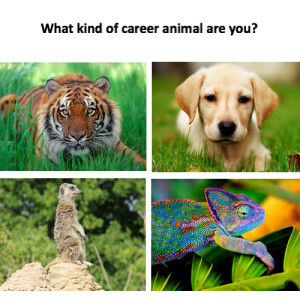 Which one of these most closely fits with your own career progress over the last few years? Whatever position you find yourself in, what are the benefits of this position versus the other three? What could you do to take some healthy steps forward in your career this year? From an employer’s perspective, there are real implications for engagement and retention of workers as we all emerge from the last few tough years in the employment market. There may be very distinct groups in your workforce that have different psychological contracts – that is what they are willing to offer and whether they are willing to emotionally invest in the organisation. Sense of job security, wellbeing and interest in building relationships will vary in ways that can affect overall productivity. Even in industry sectors that have been less affected by downturn, such as technology or pharmaceutical organisations, you may be employing all four types of workers. For example, tigers may be demanding salary increases whilst newly recruited meerkats seem to slow to engage with the organisation. So how do you manage the expectations of your tigers, boost the motivation of the dogs, build trust with the meerkats and attract the valuable chameleons? We find that spending time identifying these groups of workers through career attitudes research (focus groups or surveys) can help to identify what attitudes these four groups have towards your organisation. We also conduct workshops tailored to the needs of each of these groups to help the dogs and meerkats to understand how to boost their resilience and employability, wellbeing and career skills. We also help organisations to develop their brand to attract the chameleons and retain the tigers. Do you have a ‘corporate psychopath’ in your midst?